Take command of the spaceship Opa-Opa and blast your way through various fantastical levels as you try to take out all the enemy bases in each stage. 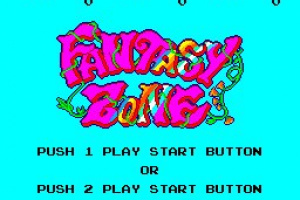 Fantasy Zone is one of those great forgotten franchises from the 8-bit/16-bit era that enjoyed lots of attention back in its heyday but tends to be ignored these days. 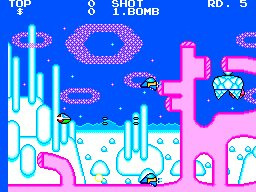 Featuring the exploits of the cute space ship Opa-Opa, this 2D shooter borrows more..
Take command of the spaceship Opa-Opa and blast your way through various fantastical levels as you try to take out all the enemy bases in each stage. Once you've destroyed the bases, you'll have to beat the stage boss in order to move on to the next level. By using your guns and bombs wisely, you'll be able to take down your enemies and explore each of the crazy environments in this side-scroller. You can also buy upgraded weapons for your ship by accessing the shop. 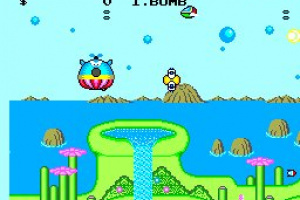 Various SEGA games over the years have referenced the Opa-Opa. Now you can play the game that started it all! I will have to play the game to see how much I really like it but just from watching the video for a minute it seems to be a really interesting fast-pased game. I loved the games from around this time but never had the money to get more than two a year, one for my birthday and one for Christmas so I'm really exited about about what the VC brings to the table, or rather brings BACK to the table, and if anyone from Nintendo reads this then thank you and if anyone from VC-reviews reads this then thanks a lot to you guys as well for all of this. This game already got an amazing remake for the PS2 (included in SEGA Classics Collection), so I don't think I'm getting this watered-down arcade port... Specially if it isn't including FM sound support, if it will be running at 50Hz in Europe, if the sound emulation is as bad as in the MegaDrive VC games, etc. I'm buying this as soon as it comes out. It just has some sort of charm to it that draws me into its happy little cute-cute world, and it IS NOT the graphics, not that I really care about how good they are either way. you don't have to watch the whole video ICE. If you feel like you're spoiling yourself by watching too much, just stop watching it. That looks like a lot of fun. I might get it when it comes out. It is a good Shmup. The difficulty isn't too bad if you get used to playing the game. The game controls are very good. It is up to how much skill the player has playing this game. The game would make a great addition for vc owners that didn't own the game and like shmup games. I used to play this game a lot when I was 9 years old. It rocked then and I am sure that it would still rock now. Cute music and art work, rocking difficulty and superb controls. Being able to purchase upgrades keeps you coming back for more. I will definitely be getting this one. Yay! 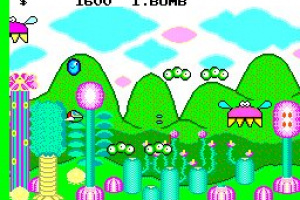 One of my fav SMS games. Love the surreal atmosphere (why did Sega abandon this kind of style?) and innovative gameplay. The sequels improved some things but the soundtrack still holds up well and is among the best on the system. This game did get a superior TurboGrafx port, though - I'd rather see that one on the VC. I had intended to buy this game for the NES. From what I've seen, it seems like the Master System's version has richer colors. 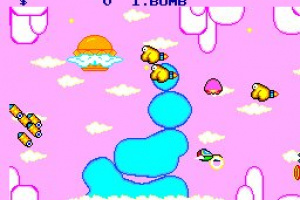 The NES version has a Kirby, side-scroller aesthetic for the background. Oh yeah, I completely forgot about the TG16 version. It's very good, almost on par with the arcade original. They all crap on the NES version though. What happened to 400 point SMS games!? ^They never existed in the first place. 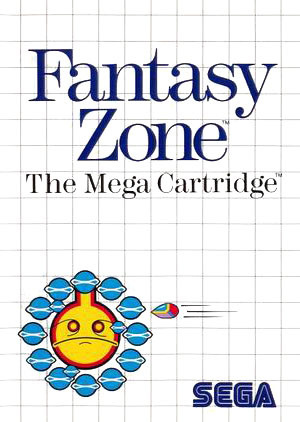 "Fantasy Zone is an arcade style shooter for one or two players." But then again it says 1 player in the upper right corner of the review. What's true now? @KeeperBvK - It is not 2 player simultaneous. You just take turns as with Super Mario Bros. I can definately recommend this one. This stands out as a very unique and memorable MS game. It can be quite a challenge though. Dying can be so frustrating! This is a pretty good game. Like others have said, the TG16 did get a better version, and IMHO Ordyn is alot like this game, but a lot better. 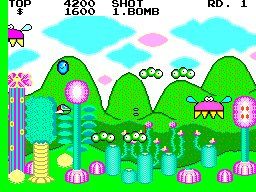 When I first got Fantasy Zone it was because my mom thought it was more a kids game due to the day glow colors, I'm glad it worked in my favor for a change. Even though my first impression was, this is nothing like the cooler looking snes shooter games...I don't believe I had so much fun for this genre of game in a long time...then I got the SMS rapid fire joystick. Mwahaha...sorry. 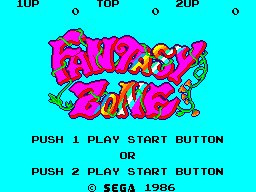 I own Fantasy Zone for NES; how does it stack up to the Master System version? I believe this was also on the TG-16. I remember it being quite fun, if not a bit to cutesy at times. Not a bad game for the 500 points. Can't believe the poor reader ratings that this game is getting. It's soo much fun IMO. never played it it looks hard. how much levels does it have? I might buy it cuz it does look fun. I gave it four stars. I just tried it last night and its fun! Its a tough game and sometimes its hard to tell who the enemies are admist the bright back drops. However if you like color, than this is the game for you. Once you learn how to use bombs effectively, it's not really that hard. Most bosses can be killed in one hit from the weight bomb thing, too - learn to love it. Got it today, I find it VERY hard as im not used to this sort of game but I am enjoying it (havent got past the first boss yet, lol). It better still be good as I choose this above the original Zelda. The other advantage is its small size, i couldnt believe it at first but then again it is short (24 blocks). 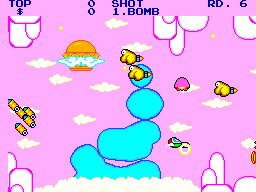 I'd realy liked to prove a shooter like this, but I heard the sequel is better, does anybody thinks FZ 2:Tears of Opa Opa may come to the VC? Or maybe I should buy this one anyway, It looks like fun. Wow. The graphics on this make Super Mario Bros. look like crap. And they were released in the same year! Wasn't this game featured on Muppet Babies? The episode where Miss Piggy and Gonzo are competing in several things to see who is best. ...I can't believe this just popped into my head. I haven't seen that show since I was 4 or 5. I picked this up again, and finally got past that final boss . . . the most absurd boss fight in recent memory for me. It sticks its tongue out at you six times and, frankly, when I finally got it I lucked out. The shop system is really annoying, because you have to equip a special weapon for a certain amount of time immediately after you leave the shop (limiting its usefulness in the last boss fights--when you would REALLY NEED them, you can't use them unless you die and can use the shop again). The bombs, likewise, can only be expended BEFORE you get to use your unlimited bombs again. There's not much to the stages, just blasting the enemy factories and avoiding really unpredictable (sometimes a good thing, for this kind of game!) hazards. It sure isn't spit and polished. 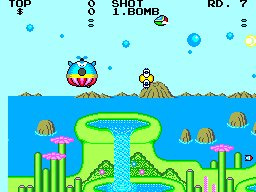 Like, the last string of boss fights could have been easier if the ship didn't reverse directions when flying away from a boss (where previously, it would stay pointed at the enemy). But I love it anyway. It's way different, it's wonderful to look at, and it's just plain fun to mess with the gizmos you can buy--even if the high price for lightning speed rocket packs make no sense (who has THOSE kinds of reflexes? Sheesh) . Great cute-em-up, with an outrageously over-written back-story. Even though I like to play FZ so much, I can't say I agree with it appearing on anybody's (IGN) top ten shmup list. As fun as it is, its design choices are overly sloppy. 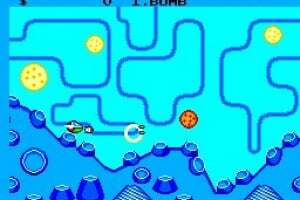 Used to play this with the trackball that was available for the Master System at my friend's house. 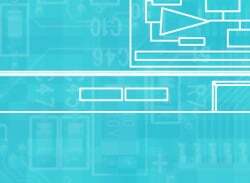 You could get a ton of speed upgrades and still control accurately. Great game... but was never as good as my friend at it... and I can't remember how far we got. Tough as nails. 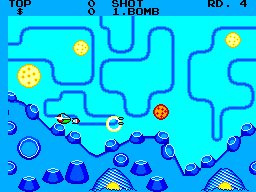 The ability to move back and forth a la Defender made it much more engaging than traditional shmups at the time. This is one of the cutest shooters out there. I love the music from the first level.